Is a golf tournament the right vehicle for your organization's fund raising? If you are willing to invest less than $30 and spend two and a half hours reading this book you will make one of two decisions. You will conclude that a golf tournament is NOT what your organization should do. Or, you will decide YES, we can do this because we have the road map to make it happen. 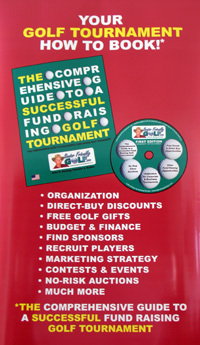 If you already have an active fund raising golf tournament, the book will offer some new ideas. Feel free to email the author: John K. Darling at GolfGuy@SeniorFriendlyGolf.com to discuss your golf fund raising event. "I do not know anything about golf, but after reading your manuscript I feel I can put on a golf tournament myself." "All I can say is WoW! You've done a really great thing here. Not only is the guide well laid out, it's totally all-you-need to get a tournament off the ground! Kudos to you on this John. I don't know how you're marketing it, but it just seems like every golf course in the country should have it. It seems like, for the benefit of the tournament director at each facility, they should have a copy available--mandatory to read--for all first time tournament folk. It should come with the cost of the event. It makes everybody's job easier." Bobby Steiner, Author of MUNI, The Jitterbug Collection and Head Teaching Professional at The Westin Mission Hills Pete Dye Resort Course, Rancho Mirage, California. "As a veteran of over thirty years of managing country club golf courses, I feel THE GUIDE is the most complete information package I have ever seen. It will help any fund raising golf tournament committee stay focused and avoid the many pitfalls out there. I was especially impressed with the section on securing sponsorships, the long term blood of any golf event." Jeff Carpenter, President of Fit Fore Golf, LLC. and PGA member. "This is so thorough! It's excellent! Although we netted nearly $60,000 last year, THE GUIDE gave me some fresh ideas and great resources! I especially enjoyed the conversational tone. I felt like you were right here with me as I read through your manuscript. Please put us down for a book!" BETH ALESSIO, Executive Director, Ronald McDonald House Charities of Southern Colorado. "The manual, or hand book as I would describe it, "The Comprehensive Guide to a Successful Fundraising Golf Tournament," is just that, very comprehensive. I work at a resort that hosts at least 2 guest tournaments a day and I see daily the problems and errors associated with this type of function. This guide would be so useful to these groups and head off many problems that we as the course operators have to fix on site. It helps you with anything from formats to goodie bags to sponsors and is just an all-around complete handbook to running a tournament properly. I would recommend this guide to any group or company looking to do a golf outing, as it is the complete guide that it says it is. I give this guide four stars and look forward to making THE GUIDE available for our tournament groups. Excellent!" Barry Clayton, Author of A to Z SECRETS from a golf pro and Director of Golf Instruction at The Westin Mission Hills Resort in Rancho Mirage, California, 2003, 2006, 2007 Desert PGA Teacher of the Year in Southern California. "…I believe associations/charities nationally will find great value in this guide. It is extremely well written, logical, and very easy to follow…especially for the novice...The one thing that rings through to me is your steady state passion to offer a product not easily found in the market place." (www.BarnesandNoble.com, www.Amazon.com) and "read only" ebook from publisher. Search the Internet by title for deeper discount prices.